I grew up in New England and took up gymnastics at an early age. After I tore my ACL and meniscus at age 14, I added swimming on the recommendation of my orthopedist. I continued with swimming and gymnastics through college and lettered in both sports at Cornell University. After college, I thought I would try my first triathlon since I had a background in swimming and track in high school. I competed for a few years before taking a break to get my master’s in Physical Therapy, get married, and start a family. 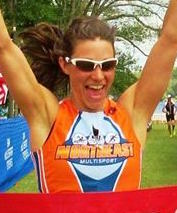 I returned to triathlon in 2008 and each season I strived for a new goal. I won the Danskin and SheRox triathlons, went to California for the Best of the US Triathlon, and placed in the top ten at USAT Age Group Nationals for four years. In 2012-2015, I traveled for the World Triathlon Age Group Championships and even reached the podium 3 times. I love the unique experience of each and every race. As a physical therapist I believe in using strength training and injury prevention to help athletes sustain in their sport as they age. I look forward to teaching and coaching my athletes to help them reach their goals in a healthy way.